Hillel and Shamai received it from them. Hillel said: Be of the students/disciples of Aaron – Love peace and chase peace, Love the creatures and bring them close to Torah. 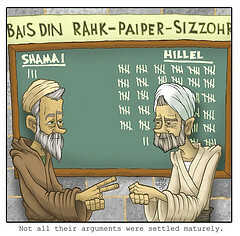 Who were Hillel and Shammai? Aharon loved peace and he actively chased after it. According to the midrash, if Aharon HaCohen saw a sinner he would be extra nice to the sinner so that the sinner felt guilty and sought to change his actions. Aharon loved others and sought to bring them close to Hashem. Examine the punctuation of the verse: it seems to indicate that there are three separate sections or statements. 1. Be like the students of Aharon, 2. Love peace and chase peace, 3. Love the creatures and bring them close to Torah. 2. and 3. are clearly similar in structure and syntax, there is clear balance in these two statements implied by the use of the word ‘love’ and by the ‘vav’ which links them. (Both have two verbs and two nouns). But the first part of the mishna does not seem to fit with the style of its latter part. In exploring this notion, Rabbi Bailey refers us to the shoresh of the words and the grammatical structure of the mishna: What is ‘ohev‘, ‘ahava‘ or ‘love’? What is the shoresh of ‘ahava‘? ‘heh’ ‘vet’ – ‘hav’ = give. This is not just a regular giving like ‘natan‘, rather it is a full giving or full dedication – ahavat Hashem means to fully give oneself to Hashem. The mishna tells us to fully dedicate ourselves to peace (ohev Shalom). This should be our goal, our life philosophy. It then tells us that we should also actively pursue peace (rodef Shalom). We shouldn’t just be dedicated, we should also actively pursue. You need more than just the philosophy, you have to actualise it. Both parts of the equation are necessary. Chasing peace without the philosophy is hollow. Why is it be like the students of Aharon rather than be like Aharon? Why is the first part of the mishna not structured in the same way as the second and third parts? Why Aharon? What do we know from the Torah about him? The most profound piece of information that we glean from the Torah is that Aharon was the Cohen Hagadol, the High priest. Implicit in the role of the High Priest is dedication to Hashem or ‘ahavat Hashem‘. Aharon loved Hashem, this was his philosophy, and he had students which was where he put his philosophy into action …The syntax is this way because we are supposed to appreciate the way that Aharon’s students tried to emulate him. Unlike the second two categories, loving and serving Hashem are not an action and a philosophy which are connected. In the context of Hashem one cannot do one first and then the other, it is simultaneous – we have to have the philosophy and do the action at the same time. This is why the first part of the mishna is written in this way. Aharon represents the duality and the constancy of Ahavat Hashem and Avodat Hashem. Each is essential to strengthen the other. This is the reason that the first part of is structured differently. In considering Rabbi Bailey’s interpretation is seems that the various parts of this mishna are clearly connected. Aharon was dedicated to the service of Hashem, he developed himself to the point where he could put that in practise by bringing his students closer to Torah. His students (us), once they had found their inner peace and actively developed themselves to the point where they could appreciate it, were then able to appreciate, value and commit themselves to the people around them and to help them come closer to Torah and in turn, to Hashem. According to Hillel, we are charged with this mission: to find our inner peace, come closer to Torah, commit ourselves to others and help them on their journeys toward Hashem and Torah.